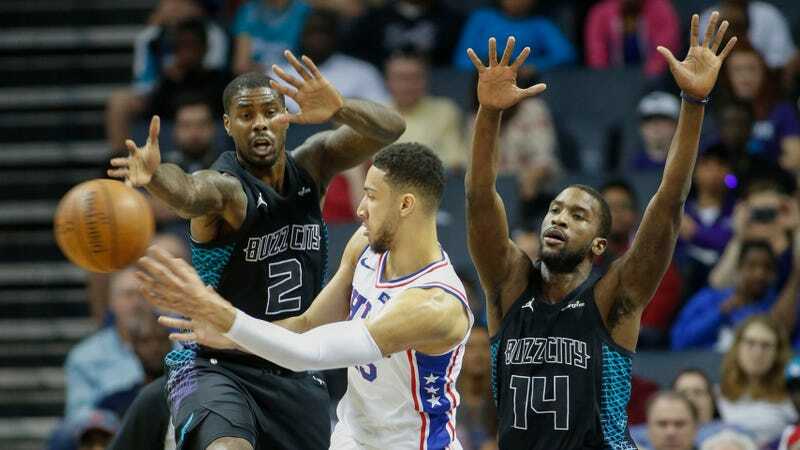 The 76ers pulled away from a sleepy and defeated Hornets team Sunday afternoon, sans Joel Embiid, behind more excellent two-way play from young Ben Simmons. It was Philly’s 10th straight win, and second straight without Embiid. Sure, the Embiid-less wins have come over Eastern Conference non-playoff teams, but still: Simmons is an absolute joy to watch on an NBA floor, utter lack of a functional jumpshot notwithstanding. Limitations can make basketball players really interesting. Players who can do it all are, of course, amazing, but that describes like one or two players per generation, max—everyone else has to construct as dynamic a game as possible around a specific set of strengths and weaknesses, and the little tricks and counters and coping mechanisms that form around a player’s vulnerabilities can be as fascinating a part of their game as their strengths. Ben Simmons is a 6'10" point guard who runs like the wind and leaps like a gazelle, but he absolutely cannot shoot, and in the modern NBA, a ball-handler who can’t shoot has just about as gaping a vulnerability as you could devise. It might come back to bite him someday, but for now let’s appreciate how he manages to be efficient and even dominant despite almost never shooting outside the paint. He’s taught himself a bevy of weird little hooks and teardrops and off-hand floaters to compensate for the fact that defenders tend to give him a ton of space to drive but not so much that he can always get all the way to the rim. Simmons does a bunch of his scoring in that awkward floater range, where most NBA players are wildly inefficient, but because of his insane basketball IQ and the way defenses have always handled him, it’s a space he’s learned to navigate with a ton of confidence, both as a passer and an occasional scorer. His game is weirdly oriented to that space—the Sixers even run a Simmons-Embiid pick-and-roll that develops just outside the low block, counting upon the combined instincts and quickness and strength of those two players to exploit the tiny slivers of space that open up in that point blank area. Today’s inside-the-arc operation included the cheeky off-the-defender’s-back inbounds trick, a fading turnaround, an off-balance floater, a running hook shot, and the usual diet of crafty look-away passes, shovel passes, hit-ahead passes, dump-offs, and all the heady little plays that allow Simmons to take over a basketball game without ever so much as threatening to shoot a jumper. It almost looks frustrating, at times, which I think is part of why his dunks pack such an impressive cathartic punch. Michael Kidd-Gilchrist, playing opposite Simmons today, is an interesting point of comparison. Kidd-Gilchrist also utterly lacks a functional jumper, but unlike Simmons, he also lacks world-class ball-handling and passing skills, and his version of compensating for it has mostly been to crash into the teeth of the defense and hope that sheer force of will can make up for what he lacks in scoring touch. Kidd-Gilchrist has topped out as a defensive specialist; Ben Simmons is the lead ball-handler and primary playmaker on a playoff team. Screw jumpers! Who the hell needs ‘em! Also, God help us if Ben Simmons ever develops a jumper.